While most Philippine beaches celebrate being gifted with white-to-warm and golden sands, Albay province takes pride in owning a long stretch of shoreline beautified by rare jet-black sand. The waterscape of this city alone, that features beautiful white surging surfs of the ocean gracefully sweeping to form a sharp contrast with sands of the deepest ebony color underneath up to the natural formations of the long stretch of beach, is itself a natural wonder added to the majestic view of Mayon Volcano. This waterscape extends to the next town of Sto. Domingo, known as the province’s “resort town”, which presents a contrast of the cool, turquoise water, black sand, and green trees that craft a very unique but charming sight recognized as one of the best in the country. Sto. Domingo, which sits down the eastern quadrant of Mt. Mayon, is a small, quaint locality whose Spanish galleon wreck site serves as a strong reminder of the rich Manila-to-Acapulco (Mexico) trade routes during the Spanish era. These historical remains lie under the sea, nine meters from the surface off the shore of Buhatan Beach which is an ideal place for scuba diving, fishing and boating. Deeper down north of this city are more black sand beaches along the towns of Bacacay and Tiwi. 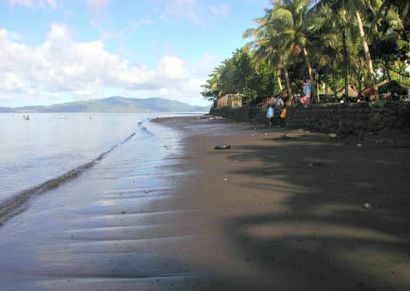 Bacacay, which lies on the northeastern slope of the Mayon Volcano, has several kilometers of irregular coastline of mostly black volcanic sand beaches found along several barangays that locate various resorts offering modest but convenient tourist facilities, a few kilometers from the town proper. Apart from swimming, these beaches are best for watching the rising of the sun or of the full moon, having an unobstructed line of view between the water and the sky, making the place a perfect escape from the city life’s hullabaloo. Tiwi, which is about 40 kilometers north of this city, has black sand beaches, kissed by the water of the scenic Lagonoy Gulf, that offer a wonderful swimming, snorkeling and diving experiences. Located at the northern side of Mt. Mayon, the coastline of Tiwi serves as an exit point of the flow of water carrying volcanic debris, including black sand, from the volcano to the Lagonoy Gulf. Albay’s black sand is a product of millions of years of natural erosion that pulverized the mighty volcanic rocks into fine-textured silts and dumped to the sea by river channels emanating from the slopes of Mt. Mayon, an active volcano, owning a record of dozens of violent eruptions since time immemorial. The city government here takes advantage of its tourism development and promotion of this priced possession that offers tourists the touch of Hawaiian Island that is famous for its beautiful black sand beaches, some of which are considered the best black sand beaches in the world. No need to visit Hawaii to experience the beauty of black sand beaches. The city boasts of the same, if not more genuine, pitch-black sand grazed by crystal clear waters down the dramatic view of Mt. Mayon that is unique from all the rest in the world, according to city Mayor Noel Rosal. And since this exciting water that is part of Albay Gulf, described as the calmest among dive sites in the country, has been luring throngs of traveling divers from all over the world, the city government now offers a place that makes every diver’s escapade into the local underwater environment truly memorable. “We now have underwater parks that make the six dive sites identified to be within the city limits more pleasing for both scuba divers with experience and for novices who want to explore our marine life beneath the level of our waters,” the mayor said. This development is part of the nautical tourism promotion that the city government is spearheading for Albay Gulf as an added product to the city’s booming travel industry, which makes it known as the “City of Fun and Adventure”. Nautical tourism includes activities such as recreational boating, marinas, cruises, water sports, marine wildlife tourism involving marine parks, maritime history and education and associated land-based components such as hotels, resorts, cafes and restaurants. This form of sustainable tourism now creates many new opportunities as well as bringing about a refocusing of existing mature tourism operations. It is also a way to revitalize coastal areas whose attractions have become outdated or stagnant, Rosal said. According to Engineer Martin Reynoso, president of the Jaycees Philippine Legazpi Chapter and a staunch advocate of ecotourism, the loose volcanic sand beaches of this city have become perfect for skimboarders because they offer varying wave breaks for both amateurs and experts. “The sport of skimboarding that now lures young people entails running as fast as you are willing to fall, throwing your skimboard onto a thin film of water and then hopping onto your board and sliding down the slope of the beach,” Reynoso said. The very best part of the Legazpi skimboarding experience is being able to share the experience with friendly people from absolutely all walks of life.